A new range of materials handling trolleys is now available from Sitecraft . Adjustable height trolleys from Sitecraft are available in 2-shelf or 4-shelf configurations. These shelves can be quickly and easily moved up and down. The useful adjustable shelf trolleys allow the user to adjust the shelf height to suit specific tasks. 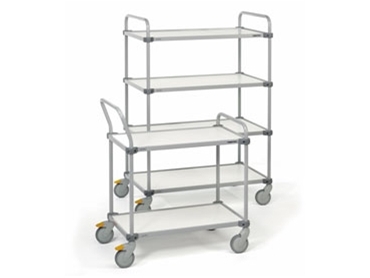 Adjustable height trolleys are supplied in a choice of two different shelf sizes.